Sparmax Quality Nail Art Airbrush. Double Action for the Professional Nail Artist. All Sparmax Airbrushes are precision manufactured from quality materials to give exceptional results every time. Spare parts are readily available to ensure years of service. Suitable for most Art & Cosmetic mediums. a. "Press down" on finger button to bring on the air. b. “Pull back” on finger button to control medium flow. Pull back slightly for small medium flow, pull back further to increase flow. 4. Handle incorporate "Adjustable Needle Stop Mechanism” on the tail which can be pre-set to control required medium flow. 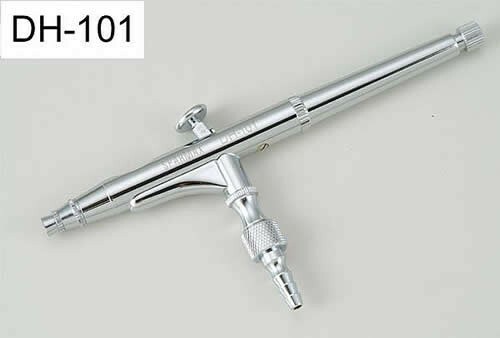 Designed to make it the perfect airbrush for beginners and professionals alike. This airbrush does not come with a hose – these are available under 'Airbrush Accessories'. Note: Requires an air compressor (not included) for operation. See Airbrush Compressors Category!